Showing results for tags '1.4s'. Hello all, I'm seeking some valuation/price advice, as I MAY be tasked with selling my father-in laws Lupo and yes, the mileage is correct...see below for the details, Can anyone sensibly advise me, I'll reply collectively once I;ve received some feed back, thank you in advance. Lupo 1.4S, A/C, '55 plate.......16,900mls, yes 16,900mls....Dealer serviced all it's life, 2 owners father and son, one 25mm x 4mm scuff on a bumber corner and a 20mm craze in paint of rear bumper top, other than that, unmarked inside and out. What could it be worth? hello i had made another topic some time ago.I need your appreciated help again!!! after much search around Greece for 1.6 engine no avy or arc around at all. i found an ajv one from a polo with 180.000 kilometers.There is no gearbox so i need to know if i can use mine. As much i have read its an engine with 120 hp power and drive by cable(mine is also dbc).I can also buy with this the ecu,the driveshafts with the brakes and the clocks. there is no loom(i have found one on ebay for 200 euros!!!). so the questions are these; 1)can i use my gearbox? 2)i need only the engine loom right?if so any possibility used from another model?or only from ajv? 3)the driveshafts will fit in lupo?both front and back? 4)my car doesnt have abs will i be able to use? 5)are the engine mounts the same as are with avy? 6)as long as i have the ajv exhaust manifold will i be able for start to use the rest of the exhaust? 7)any other loom i can use? the engine,ecu,driveshafts and clocks will cost me somewhere around 500 euros is there anything else i will need and i forget i do?i need to have a budget on my mind to decide whats better. Itzkelz posted a topic in New member? Hi everyone my names Kelly, I have a yellow Lupo 1.4s that I love dearly. However I've had it many many years now and I no longer have a need for a car. I wanted the car to go to a loved home. Someone who would give it some TLC that it needs and value it. I'm new to this club and am not actually sure if your allowed to sell cars on here so I apologise now if that's not allowed. Like I said I wanted to reach out to people who love lupos as much as me and who maybe wanted a new project to work on. If anyone's interested in purchasing it please get in touch and we can talk more about it. Best wishes. The Black 1.4s I shall call you EVA! So I have bought a new lupo for my second car! Will be driving it soon! Adam_14 posted a topic in New member? Hi, i recently fitted a lupo sport inlet manifold and throttle body to my 1.4s but ive had problems with the car such as rough idling. The car sounds as if its cammed when at idle. On occasion the car will also cut revs and wont rev at all, i do have engine codes and i have checked them, it says P0106 - MAP/Barometric Pressure Circuit Range/Performance Problem It also says fuel bank trim 1, i have replaced the map sensor but did not fix the problem. The car is fitted with a gti throttle body which has extra vacuum pipes that don't connect up to my engine. I was wondering if it was just a case of there not being enough fuel and that it just needs mapping but am unsure if it is something else. Does anyone have any ideas to what it could be? Just updating the photos better quality, Front View Passenger front side Side View Passenger rear side Rear view Drivers rear wing Drivers front wing Damaged spot light front Interior Back Interior Engine Bought it beginning of January, its got less than 70k on the clock with a full service history it's 2001 plate also am the 3rd owner from new too. It's got a few scuffs around the bumpers but will be going in for a complete respray ASAP, will probably have it viper green, it's the new sicrocco GT colour hopefully it will look good, also i am debating on wether or not to have it reprayed a nice gloss white. list of jobs i have in mind over the next following months Jom coilovers* (was unsure which ones to purchase but after reading peoples comments on the site i will propbably end up getting them as budget isnt huge)Paint Job* (haven't made got any quotes on costing yet, but depending on cost it will either be Viper Green or Gloss white, as there are quite a few small scuffs on the car so just feel a fresh new colour would do it a world of good.TintingHavent really got any more ideas other than whats above, so open to suggestions. The "Nody" Mobil - HDR + Fisheye Graffiti Tunnel pics!! MY VW LUPO 1.4 What do you think? I test drove a Lupo sport today noticed it had disc brakes on the back I was wondering if the 1.4s has disc or drum brakes. Anyone know? Lupo 1.4s/sport!!! £1400 Cash ready!!! 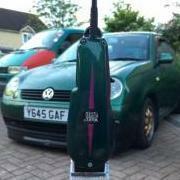 After a Lupo/Arosa sport, got £1500 cash on me, Please let me know (inbox) if there's any for sale!!! cheers, Kaeten. lupo 1.4s need both door locks with a key? both barrels are mashed on my my car likes to keep opening the windows and not locking so need asap. post on here or pm me.